Although it’s humbling to receive praise, it’s the hidden difference that teachers make in their student’s lives which often goes unnoticed, or unexpressed. I use the word hidden because unlike words of affirmation which are clearly spoken, the hidden difference may forever remain buried in the heart of the student. Below is a poem I wrote shortly after Joseph left my classroom almost 8 years ago. It speaks to the notion of the hidden difference. Another school year is coming to an end. The stress I feel now will soon have time to mend. I can’t help but reflect on the memories that are now a part of my collective past. Each of them brings with it vivid imagery that is sure to last. It seems that every year is highlighted by a single life event. For me, the birth of my daughter fills the pages of this year’s story and the joyous time I spent. So many things have changed since beautiful Emerson blessed us with her embrace. Each time I hold her in my arms, it’s impossible not to feel the tremendous power of God’s grace. One change I hadn’t quite expected was the relationship I would now have with my class. For when I returned from my leave I saw them from the eyes of a father, something I had never experienced in the past. I remember the struggles of a particular student in my class, who I challenged daily to make the right choice. Unfortunately, he was without a father and felt as if he had no real voice. I think of my daughter and the tremendous love I shower her with every day. How could this student survive without this same love from his father? I was determined to find a way. 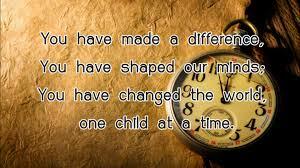 So I set out to change his reality by being the father that was absent from his life. What a daunting challenge it was, like cutting cheese with a dull knife. That student has since left our class and perhaps I’ll never see him again. For if I do, I will celebrate his growth as a person and reflect on what was then. I find comfort in knowing that I will never stop loving my daughter and always keep her in my sight. With regard to this student, it pains me as his teacher to wonder what could have been or just what might. I may never know the difference I made in his life, but I find solace in knowing that I cared deeply from the start. Every teacher leaves a special gift with their students, which will forever remain embedded in their hearts. For every teacher who doubts whether or not they make a difference for their students, let me be the first to say, you absolutely do. I invite you ponder the hidden difference you’ve made and to be at peace with the reality that you may never know for sure what exactly that difference was. Unlike the standardized testing culture you work in, which requires that you collect evidence in order to prove academic gains, the difference you’ve made in their hearts requires no evidence. Heart change can’t be quantified with numbers or percentages. You don’t need to know the difference you made in order to confirm that you made a difference. Thank you for the wonderful work you do in shaping young minds and hearts.